Cover: David Rupel in St. Petersburg, Russia. Note: Photo quality improved Dec. 2018. 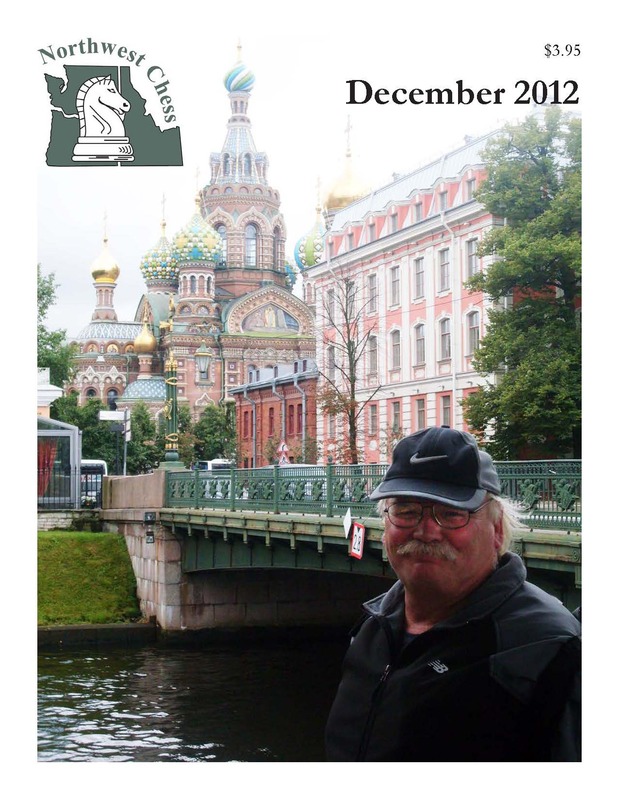 32-page issue with Rupel Goes to Russia by David Rupel, Washington Challengers’ Cup by Frank Niro, Washington Chess News by Russell “Rusty” Miller, Book Review by IM John Donaldson, Idaho Chess News by Jeffrey Roland, Oregon Chess News by Frank Niro, and the usual Grand Prix report by Murlin Varner. 8 pages are printed in color! Cover: The National Chess Day celebration group photograph taken in Boise, ID. Photo by Jeffrey Roland and Frank Niro. 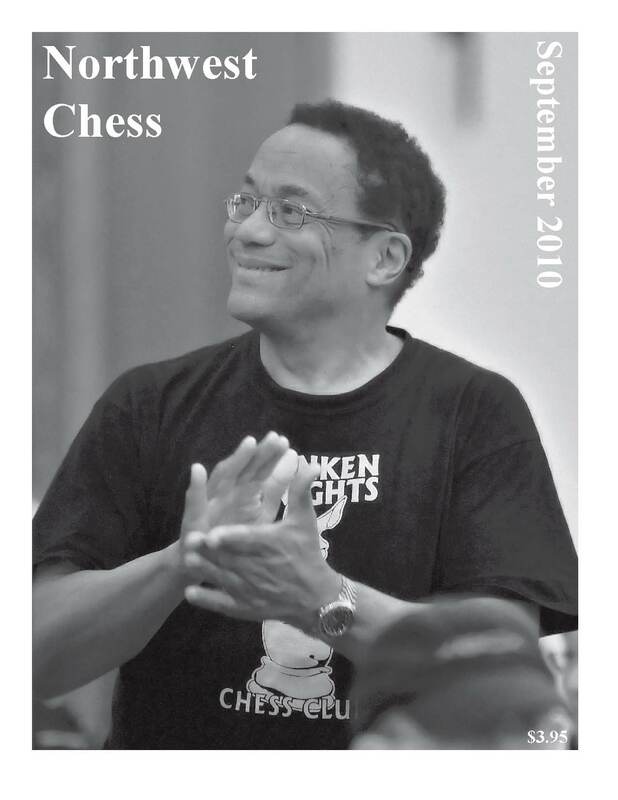 32-page issue with National Chess Day Events, Washington Chess News by Russell “Rusty” Miller, Idaho Chess News by Jeffrey Roland, Oregon News by Frank Niro, and a Dr. Ralph Hall Northwest Grand Prix report by Murlin Varner. Cover: Steven Breckenridge; photo by Jeffrey Roland. 48-page issue with Oregon Open report and games; Oregon Open Gallery of Past Champions; Additional U.S. Open Games and Photos; Washington News by Russell “Rusty” Miller; Emerald City Open report by Carol & Fred Kleist; Idaho News by Jeffrey Roland; Oregon News by Frank Niro; Book Review by IM John Donaldson and a Dr. Ralph Hall Memorial Northwest Grand Prix report by Murlin Varner. 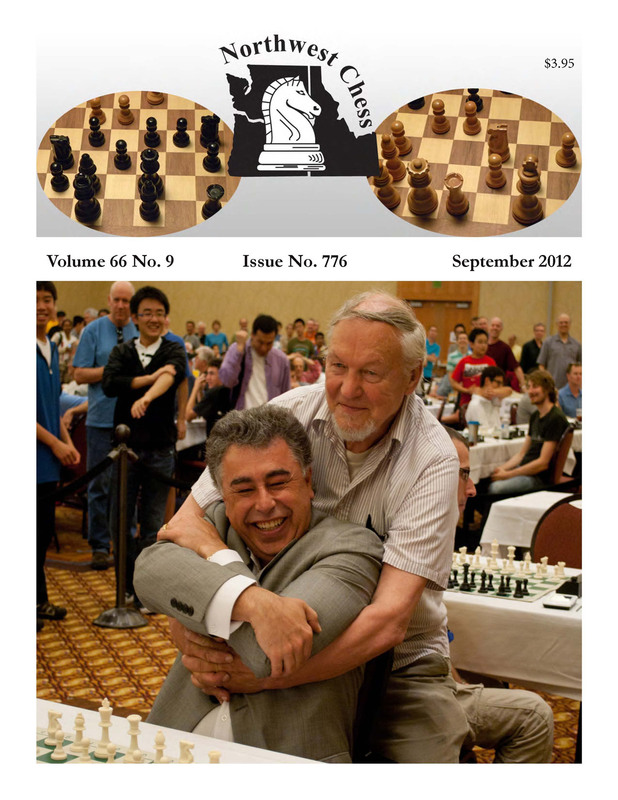 Cover: Photo taken by Jeff Roland at the 2012 U.S. Open in Vancouver, WA, a re-shoot of a well known image of Viktors Pupols (standing) and Yasser Seirawan (sitting) originally snapped in 1974. 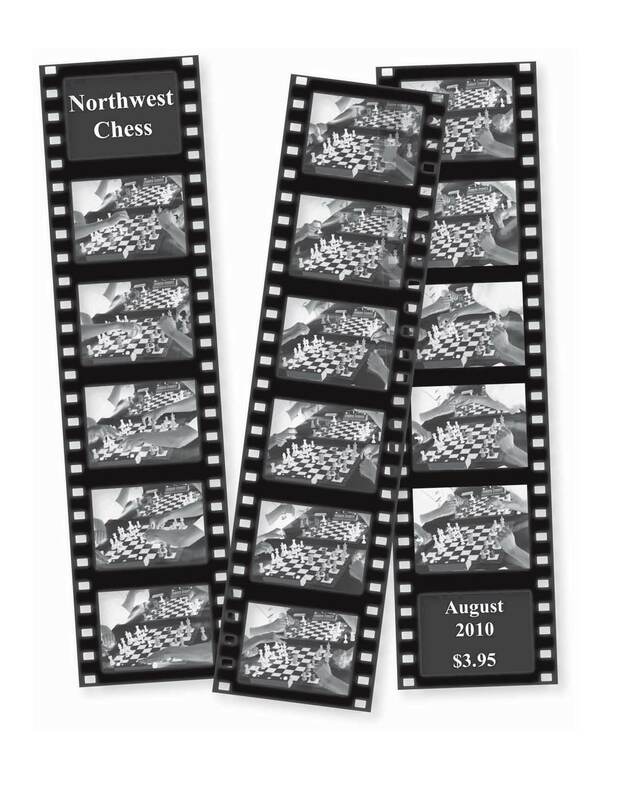 32-page issue with "U.S. Open Games & Photos," Idaho chess news, "Rupel vs. Pupols: 2012 OR Senior," Washington chess news, "Oregon News: Raptis vs. Eagles," and a Dr. Ralph Hall Memorial Northwest Grand Prix report. Cover: The picture, taken by Jeff a few months ago when he and Frank went to Crossville, Tennessee, shows the highly dedicated USCF staff that we have all come to appreciate over the years! 48-page special U.S. Open edition produced by Editor Frank Niro and Assistant Editor Jeff Roland. 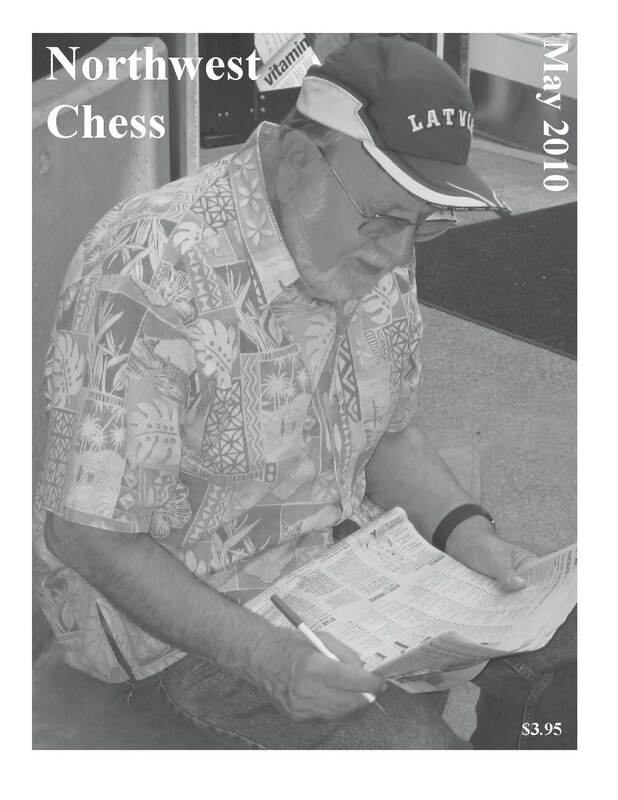 Includes U.S. Open related content, an article by Frank Niro about the late Dr. Ralph L. Hall, the "Most exciting game of 2011," a reprint of Yasser Seirawan's fictional story "Hapley’s Project," Idaho chess news, a report on the Oregon Senior Championship, and a Grand Prix update. Cover: Four National Champions, by Breck Haining. 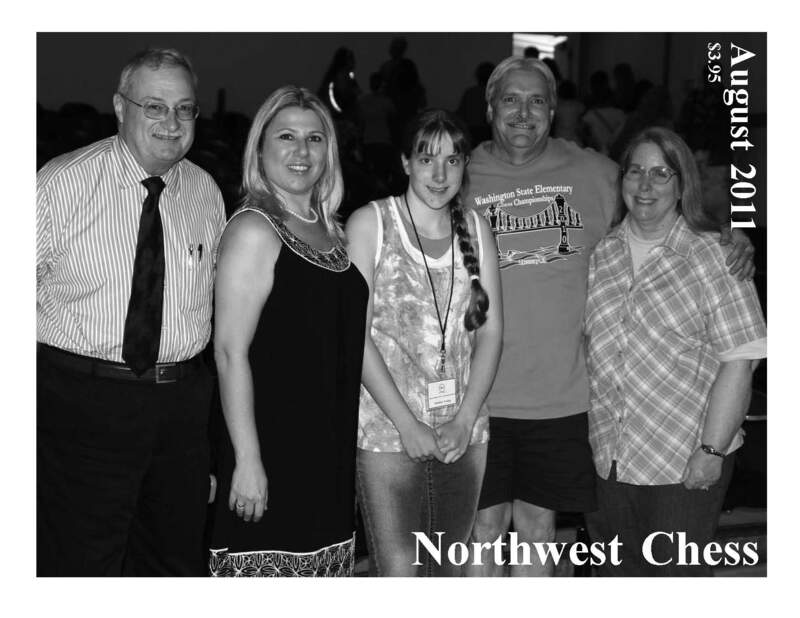 24-page issue with Washington Open report and games, Idaho chess news, Northwest news, WA Invitational games, OCF board meeting and WCF membership meeting minutes, and a Grand Prix update. Cover: World Connected to Northwest. 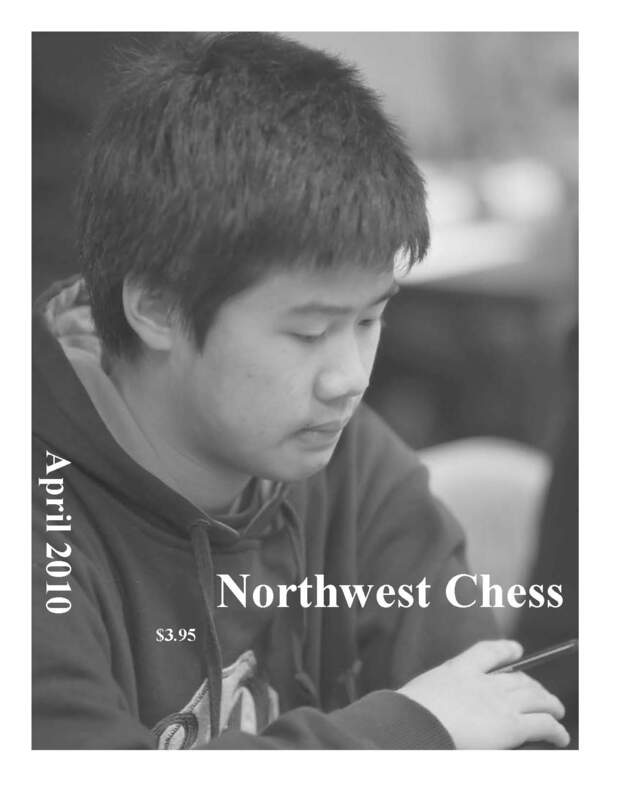 24-page issue with games from the Oregon Championship, "A Fish in Cold Waters" by Mike Murray, Idaho chess news, Northwest news, "Memories of the Boulevard" by Dan Bailey, and a Grand Prix update. Cover: Nedzad Imamovic, by Jeff Roland. 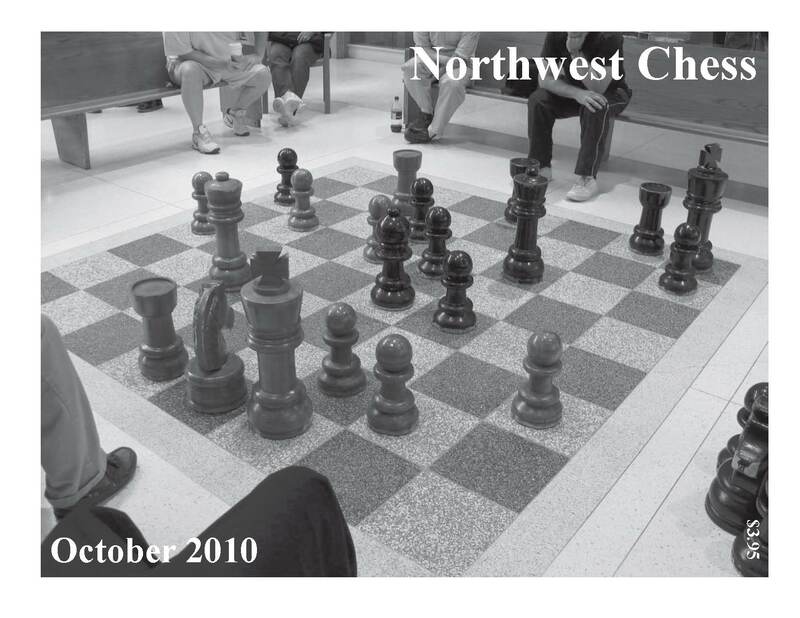 32-page issue with "Brilliancies and Other Annotated Games," Idaho chess news, games from the Washington Premier and Invitational, "How to be a Good Chess Parent" by Kevin Bachler, "Lakeside Wins WA HS Team Championship" by Siva Sankrithi and more! 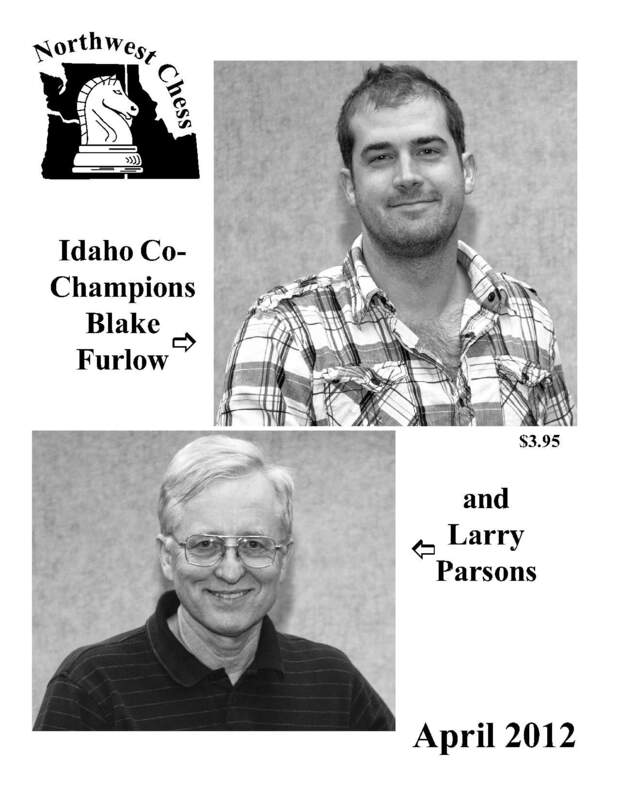 Cover: Idaho co-champions Blake Furlow and Larry Parsons, by Caleb Abernathy. 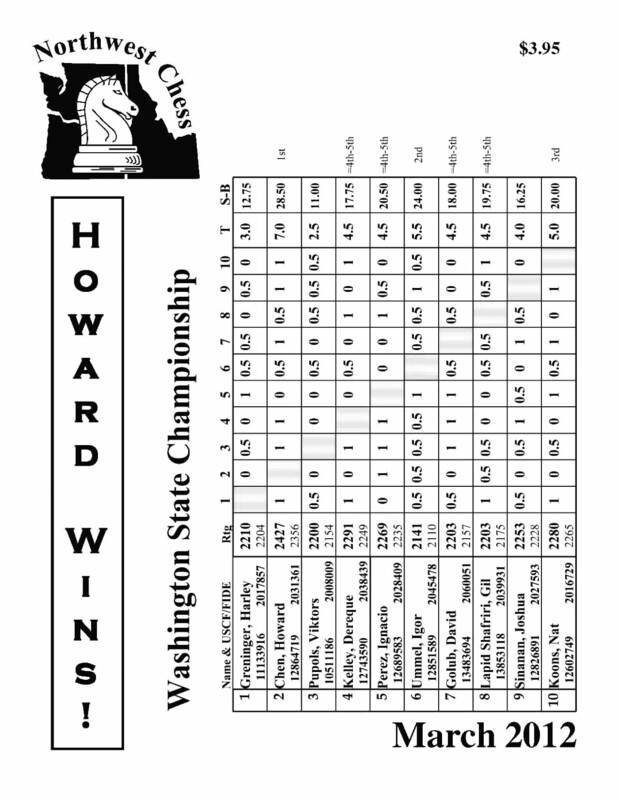 32-page issue with Oregon Championship report, Oregon Junior Closed report, Idaho chess news, Collyer Memorial report, more Washington Championship and Premier games, a Grand Prix report and event listings. Cover: WA Championship crosstable by Fred Kleist. 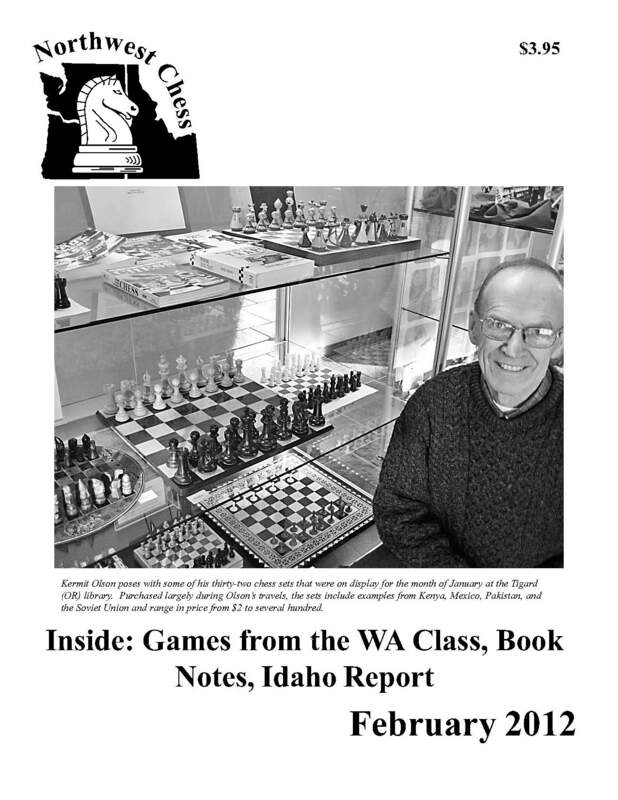 24-page issue with games from the WA Championship, "Idaho Chess News" by Jeffrey Roland, other Northwest News and the usual Grand Prix update and event listings. 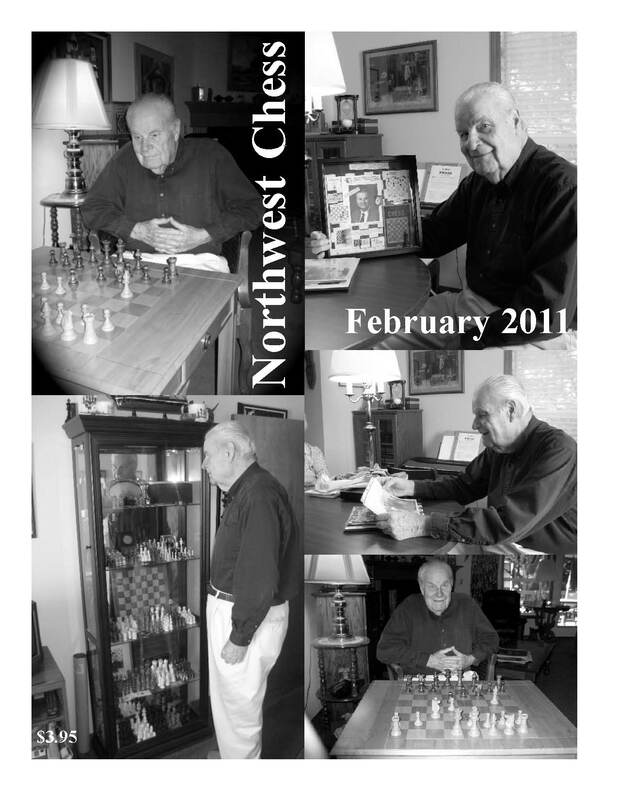 Cover: Chess set collector Kermit Olson. Photo credit: Sally Ho, The Oregonian. 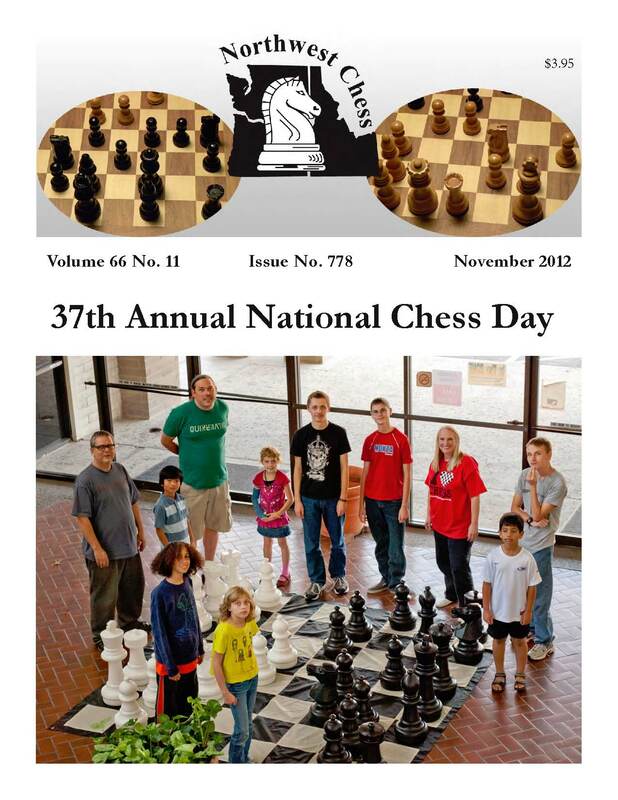 24-page issue including games from the 2011 WA Class, "Idaho Chess News" by Jeffrey Roland, "Book Notes" by IM John Donaldson and the usual future event listings. Photo credit: Judy Greninger 24-page issue with "Brazil: Chess, Music and Papaya" by Guy Bashansky, "Marcell Szabo at the W.Y.C.C." 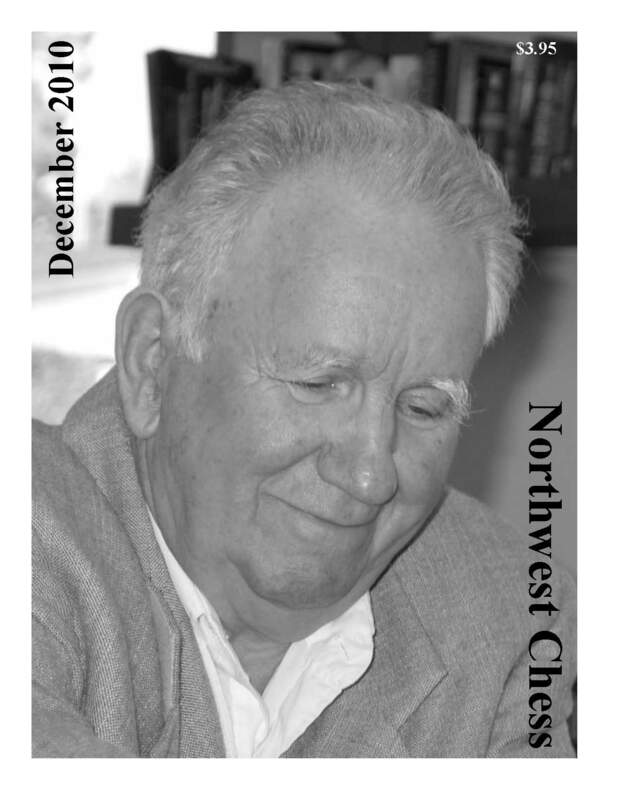 by Csaba Szabo, "Book Notes" by IM John Donaldson, "Idaho Chess News" by Jeffrey Roland, "Northwest in Southern California" by NM Steven Breckenridge, "Washington Challengers' Cup" by Harley Greninger, and the usual Grand Prix update. 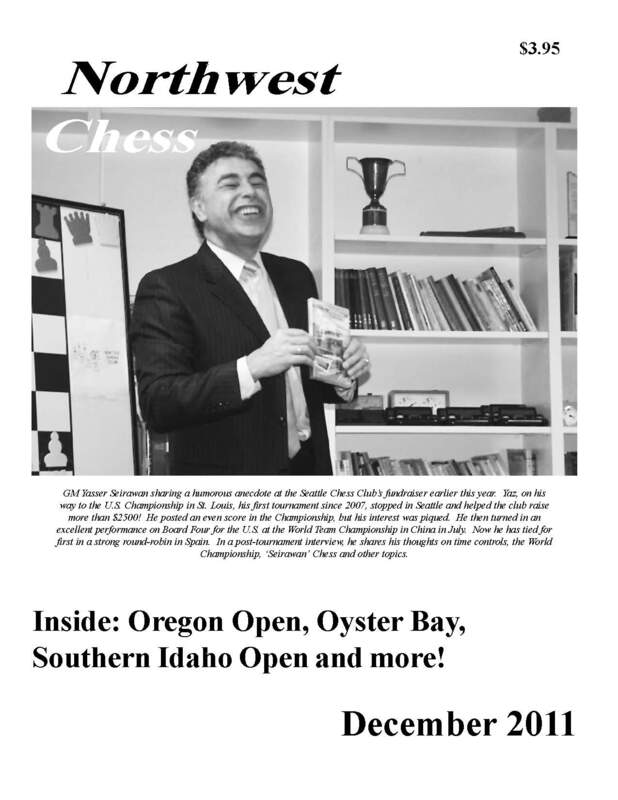 Cover: GM Yasser Seirawan Photo credit: Deborah Petzal 24-page issue with Games from the Oregon Open, Northwest Chess News, Oyster Bay Inn Classic report, Idaho Chess News, Interview with GM Yasser Seirawan, and the usual Grand Prix update. 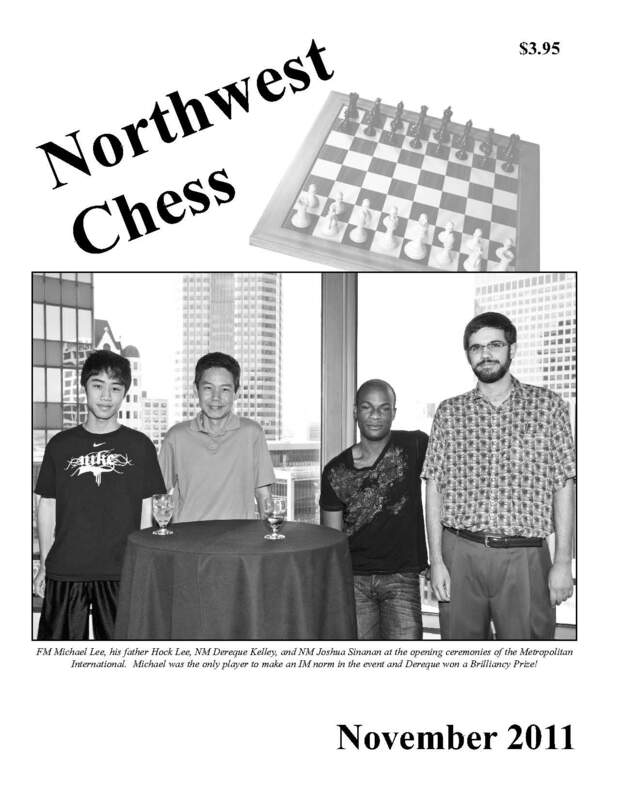 Photo credit: Betsy Dynako 24-page issue with a U.S. Open report, a Metropolitan International report, Idaho Chess News, an article by Bill McGeary, a couple of creative pieces by Carol Kleist, a National Chess Day report, and the usual Grand Prix update. 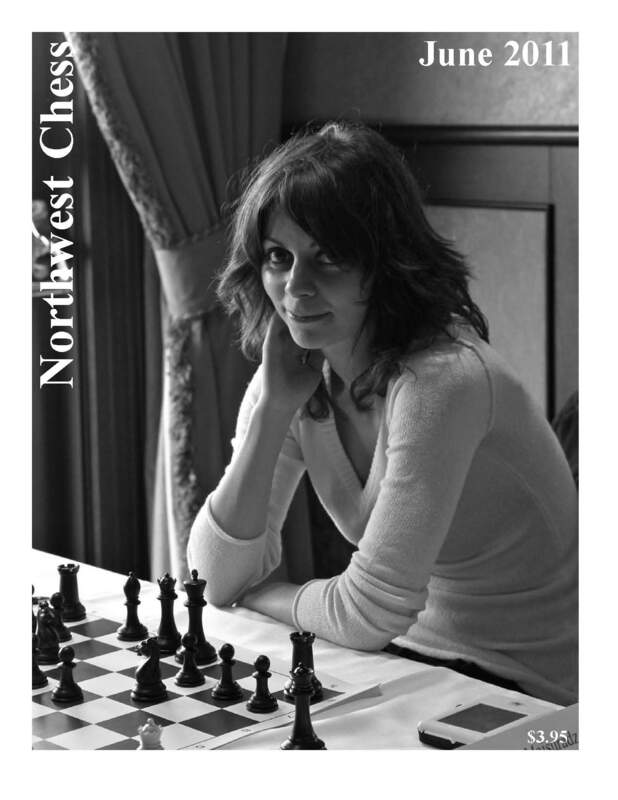 Photo credit: Andrei Botez 32-page issue with Portland Chess Club Centennial Open report by Frank Niro, Idaho Chess News by Jeffrey Roland, SPNI History by Howard Hwa, Two Games by Georgi Orlov and Kairav Joshi, articles by Philip McCready and Bill McGeary, Book Reviews by John Donaldson, a Grand Prix report and a USCF Delegates’ Report by Fred Kleist. Photo credit: Philip Peterson 24-page issue with "Yaz Goes to China" by Yasser Seirawan, "Oregon Senior Championship" by Frank Niro, "Oregon Senior Games" by Steven Deeth and the usual Grand Prix update. 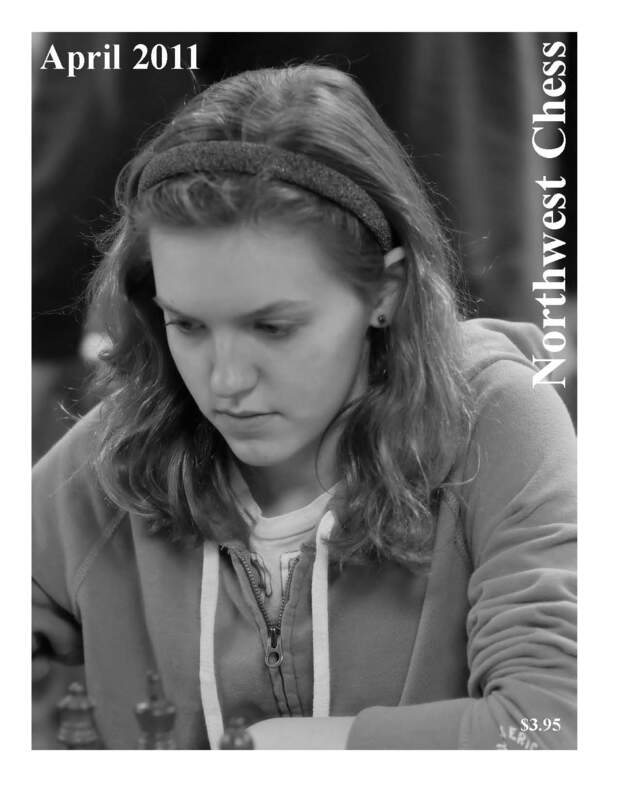 Cover: Heather Young (center) represents Washington in the Susan Polgar National Invitational for Girls. Photo credit: Susan Polgar Foundation. 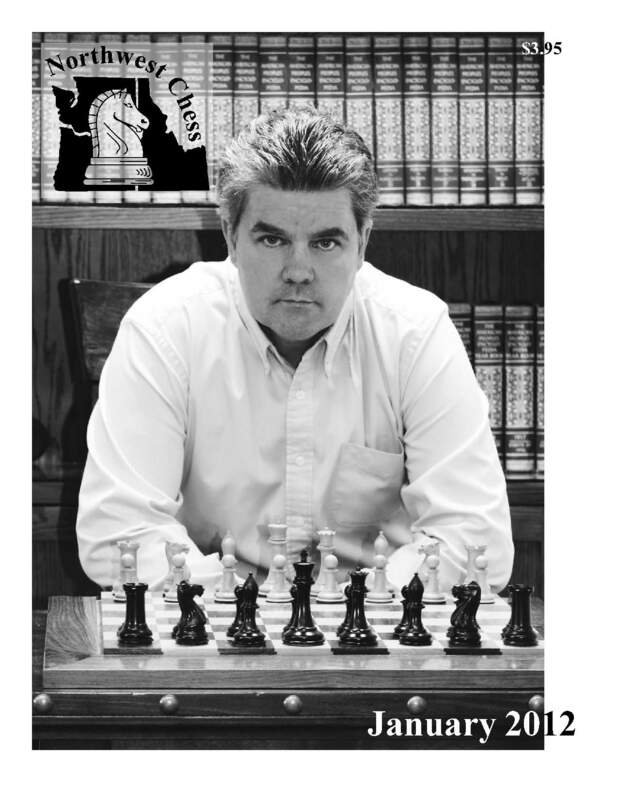 24-page issue with "In Praise of GM Seirawan" by David Kelley and August Piper, "Washington Open" by Georgi Orlov, "Collyer Memorial Game" by Cameron Leslie and Ted Catton, "Emerald City Open" by Fred Kleist, an article by Bill McGeary, book reviews by John Donaldson, and the usual Grand Prix update. 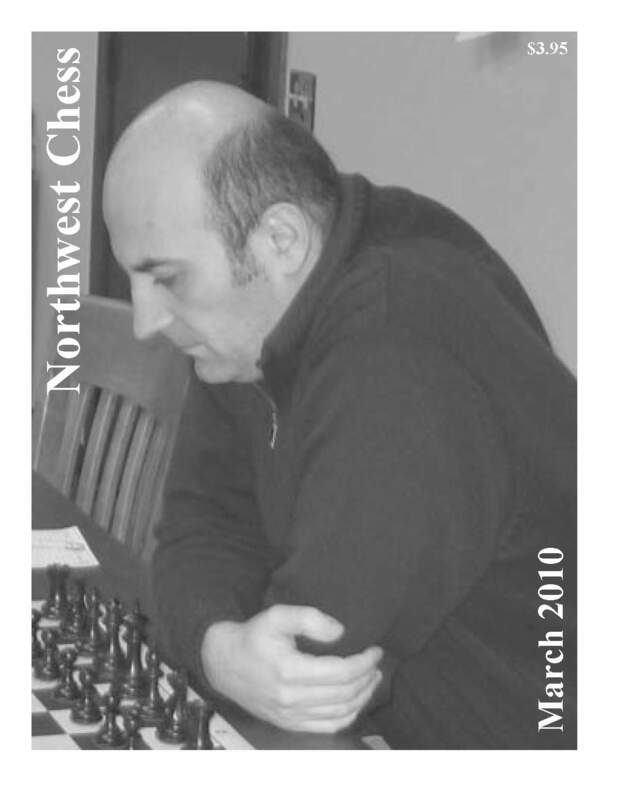 Photo credit: Philip Peterson 24-page issue with Washington Official Events Report by Gary Dorfner, Keres Memorial report by Georgi Orlov, Northwest Chess History by Russell Miller, Correction: That’s Nathaniel Yee, Three Washington Open Games by Steve Breckenridge, Piper–Davis, Washington Open by Joe Davis, an article by Bill McGeary, book reviews by John Donaldson, and the usual Grand Prix update. 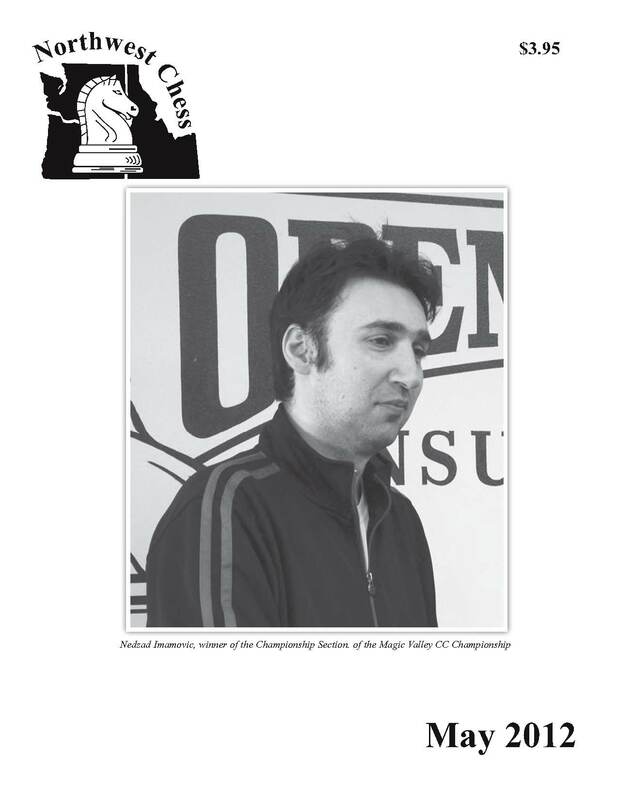 Cover: WGM Nino Maisuradze Photo credit: Polly Wright 24-page issue with Grand Pacific Open report by Roger Patterson, Far West Open report by Phillip Carson, book reviews by John Donaldson, a scholastic report by Gary Dorfner, an article by Bill McGeary, and the usual Grand Prix update. 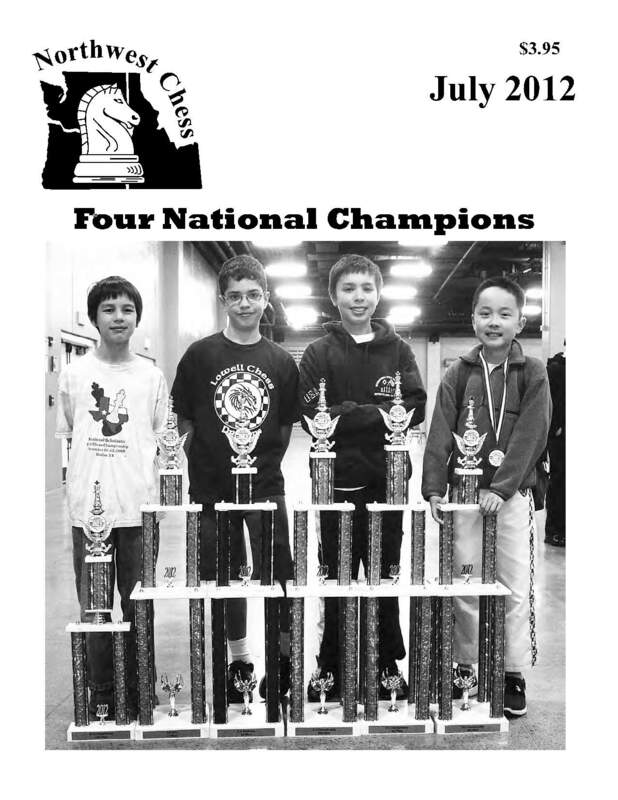 Photo credit: Betsy Dynako 32-page issue with Larry Parr Obituary by John Donaldson, National Girls Champion - Alexandra Botez story and game, Washington Championship report by Fred Kleist, Two Games by Daniel He and Samuel He, Oregon Championship report by Frank Niro and Ralph Dubisch, Yaz at the SCC with photos by Arnie Garcia, an article by Bill McGeary, and the usual Grand Prix update. 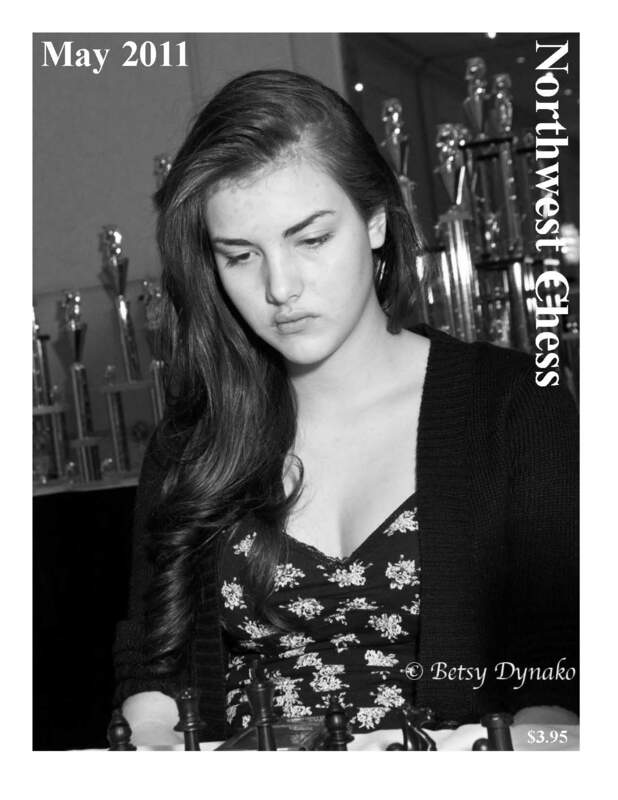 Cover: Kate Tokareva, Washington Girls’ Champion Photo credit: Philip Peterson 24-page issue with Washington Championship Games, WA Championship Brilliancy Prize by Nat Koons, an article by Bill McGeary, and the usual Grand Prix update. Photo credit: Philip Peterson 24-page issue with a 19th David Collyer Memorial report by Kevin Korsmo, a Port Townsend game by Mike Murray, Book Reviews by John Donaldson, articles by Bill McGeary and Dana Muller, and a 2011 Grand Prix report by Murlin Varner. Photo credit: Frank Niro 24-page issue with Ralph Hall obituary and news, Washington Class report by Josh Sinanan and Gary Dorfner, Gresham Open report by Neil Dale and Charles Schulien, "Wayne meets Garry in St. Louis" by Wayne Hatcher, "Photo Art Show Opens" by Philip Peterson, articles by Bill McGeary and Dana Muller, Portland Chess Club officers photo and final 2010 Grand Prix results by Murlin Varner. Photo credit: Philip Peterson 32-page issue with "Letters to Ernst," a report on the World Senior Championships by Michael Schemm, "Games Corner" by Charles Schulien, "Seattle Sluggers Season Sign-off" by Alex Guo, "SCC at the 28th Western States Open" by Fred Kleist, and articles by Dana Muller and Harley Greninger. by Rusty Miller 24-page issue with Ernst Rasmussen BDG Thematic report by Dennis McGuire, WCF President’s Corner by Josh Sinanan, "Seattle Chess Club, Then and Now" by Roger Myers and Rusty Miller, "Dutch Treat: book reviews" by IM John Donaldson, "Games Corner" by Charles Schulien, "EG Short and the PCC" by Casey Bush, "Championship Training" by Corey Russell, and another GP update by Murlin! 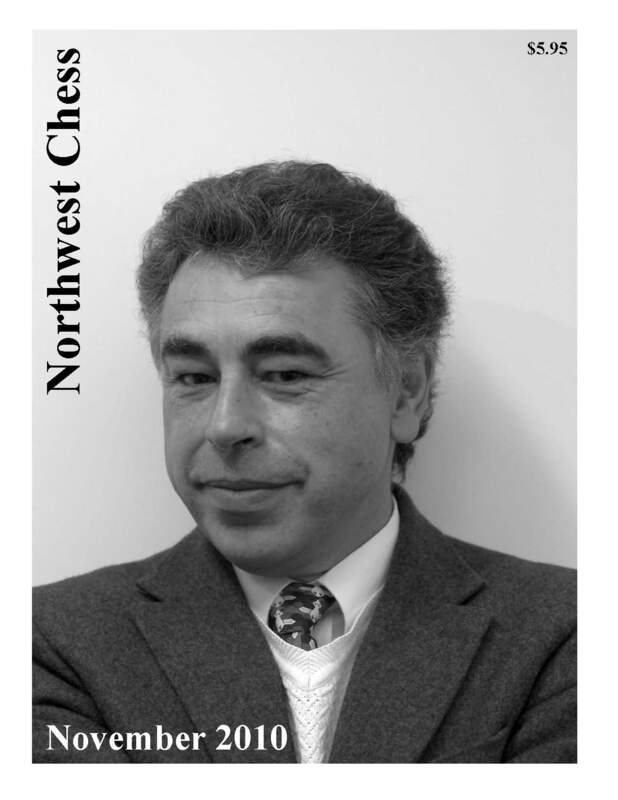 Grandmaster Yasser Seirawan by Jeroen van den Belt 48-page special issue with a Bent Larsen Eulogy, a U.S. Open report, an original story entitled "Hapley’s Project" by GM Yasser Seirawan, "Marcell: A New Kid on the Block" by Tibor Károlyi, a report on the Silverdale Beach Hotel Classic by Kris Dietsch, articles by Bill McGeary and Dana Muller, and the usual monthly GP update by Murlin Varner! by Russell Miller 32-page issue with an Oregon Open report and games, a Seattle Sluggers update and articles by Harley Greninger, Bill McGeary and Dana Muller. Also the usual monthly GP update by Murlin Varner! 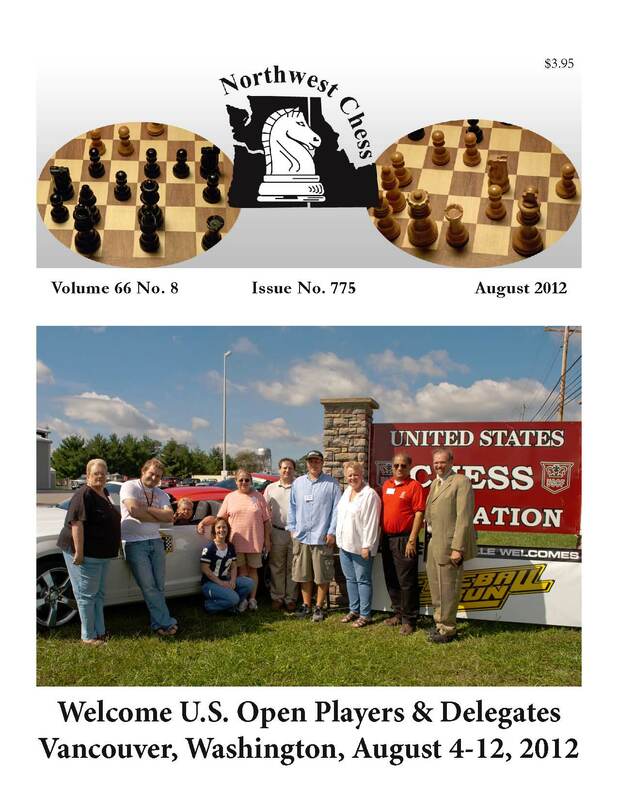 Philip Peterson 24-page issue with a USCF Delegate Report, "Washington Championship Games" by Howard Chen, "Harmon Memorial Report" by Gary Dorfner, "Championship Training" by Corey Russell, "Ernst Rasmussen BDG Tournament" by Stephen Chase and articles by Harley Greninger, Bill McGeary and Dana Muller, and another GP update by Murlin Varner. 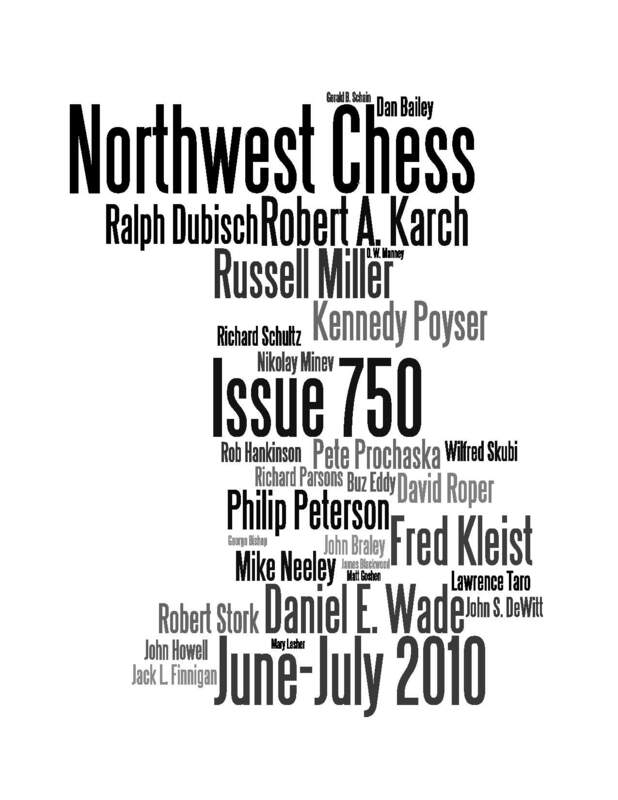 Bughouse Negatives by Philip Peterson 32-page issue with "Championship Training" by Corey Russell, "Games Corner" by Charles Schulien, "Stevenson Elementary at Nationals" by parents and Elliott Neff, "Rogers – Rompogren" by Bill Rogers and Ralph Dubisch, "Correspondence Chess" by Stephen Chase, "Book Review: Chess Duels" by Randy Kaech, articles by Harley Greninger, Bill McGeary and Dana Muller, and another GP update by Murlin Varner. Special combined 750th Issue! 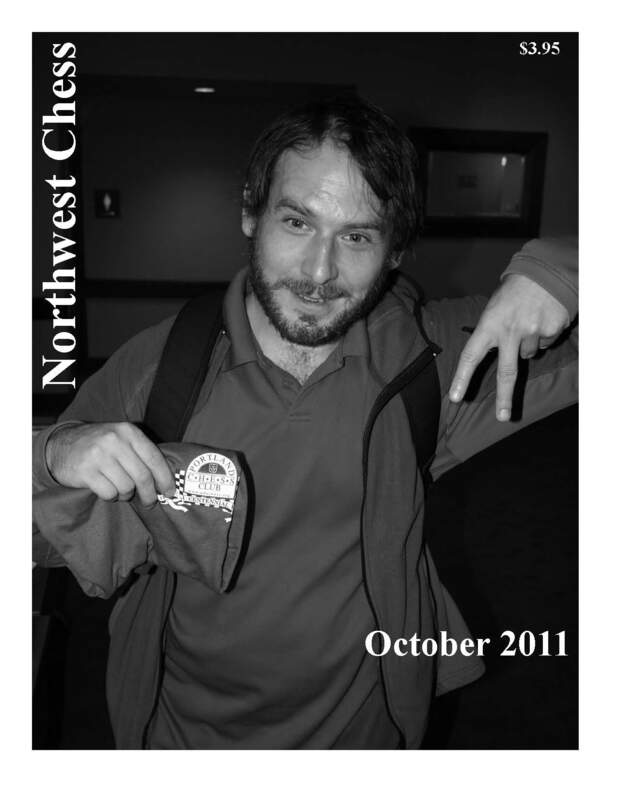 This is the 750th issue of Northwest Chess magazine (including the early years when it was Washington Chess Letter). 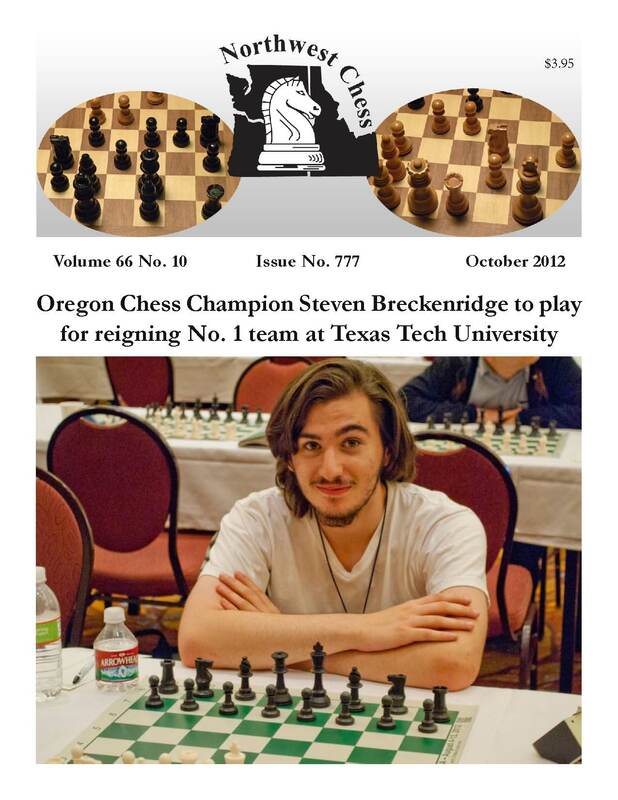 48-page issue with reflections of former NWC editors, a report on the 2010 National Open, Jefferson County Chess Day, World Championship 2010, Oregon Championship Games, News of the Weird, and articles by Harley Greninger, Bill McGeary and Dana Muller, and a two-month GP update by Murlin Varner. See the press release on this combined issue. Includes minor corrections compared to print version. Cover photo: Neil Dale. Photo credit: Frank Niro. 24-page issue with book reviews by John Donaldson, reports on the Oregon Class Championships and Port Townsend Open, articles from Bill McGeary and Dana Muller, and the usual GP update. Due to the lateness of this issue, the full PDF file is available without the usual 2-3 month waiting period. 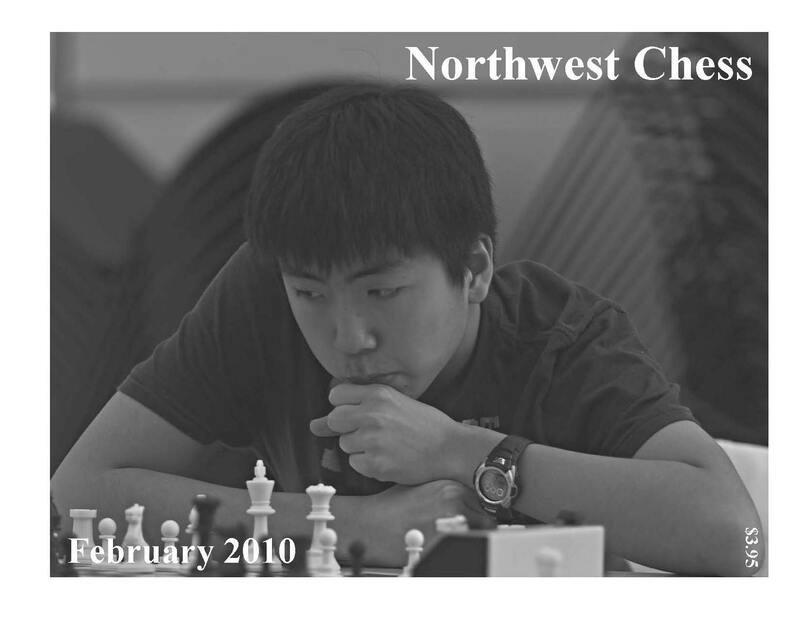 Cover photo: Howard Chen, Washington State Chess Champion. Photo credit: Philip Peterson. 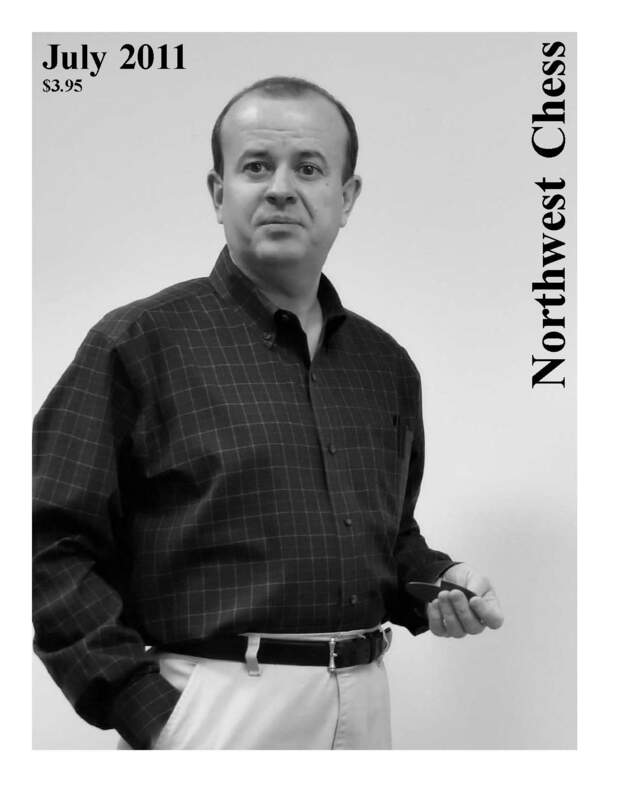 32-page issue with Robert A. Karch obituary by John Donaldson, "Josh and Curt Go To London," Dave Collyer Memorial report by Kevin Korsmo, articles from Bill McGeary and Dana Muller, and a GP update. Due to the lateness of this issue, the full PDF file is available without the usual 2-3 month waiting period. Cover photo: Oregon chess champion Radu Roua. Photo credit: Russell Miller. 32-page issue with stories about the WA/OR state championships (including Oregon Championship portraits), Tales From the Icebox by Chris Kalina, Local Rivalries: Remembering Kent Pullen by Mike Murray, articles from Bill McGeary, Harley Greninger and Dana Muller, and a Grand Prix update for 2010. 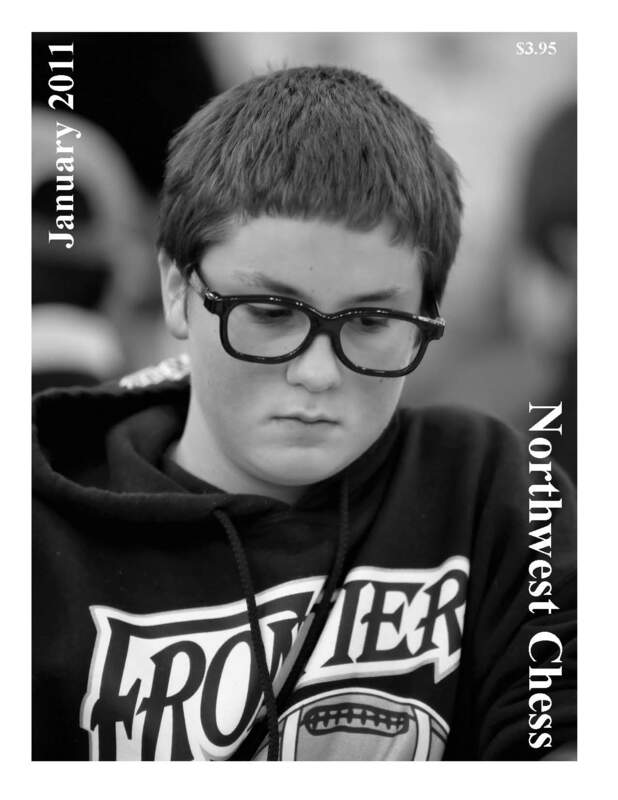 Cover photo: Michael Omori, Washington Junior Chess Champion. Photo credit: Philip Peterson. 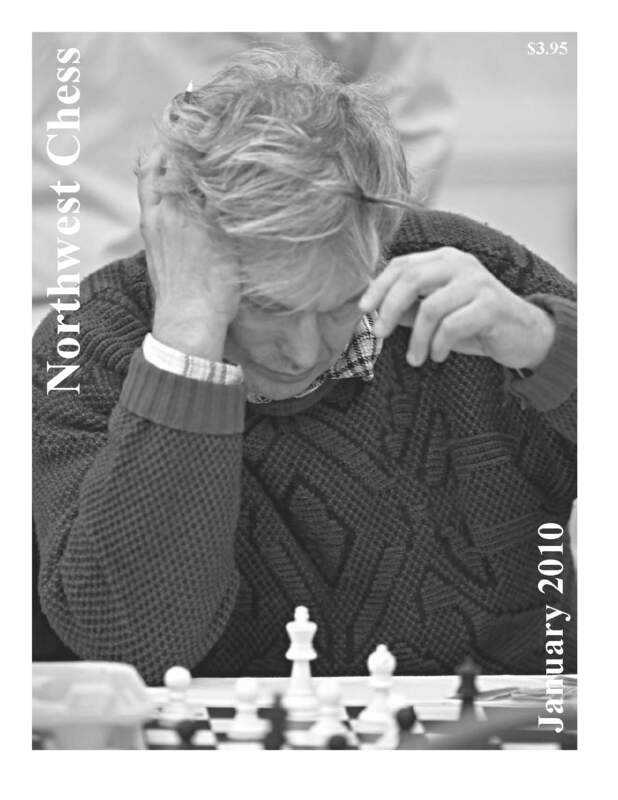 32-page issue with stories about Kennedy (Kip) Poyser, the North American Open and the Washington Class Championships; Washington Junior Closed photos, articles from Bill McGeary, Harley Greninger and Dana Muller, and final 2009 NW Grand Prix standings. Some copies of the January 2010 magazine have a printing error (some pages duplicated, others missing). 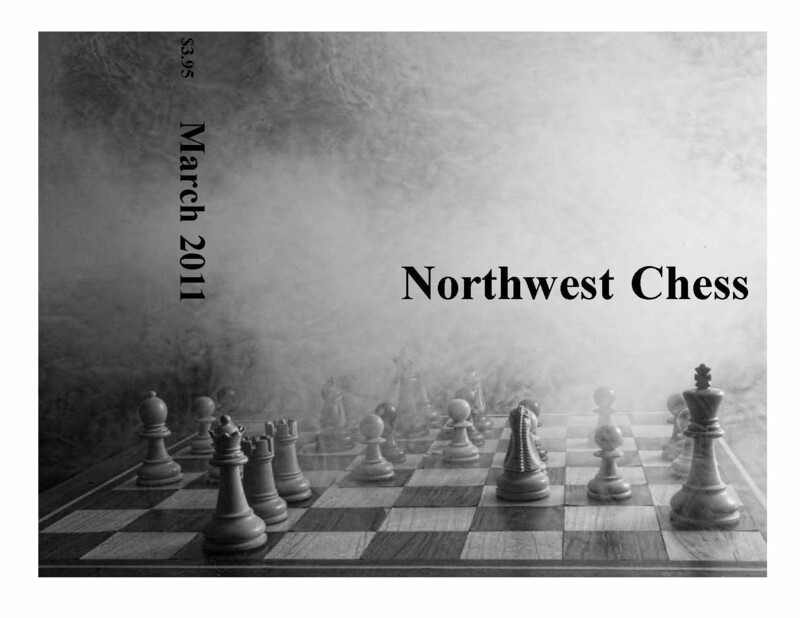 If your copy is printed/bound incorrectly, e-mail info@nwchess.com. 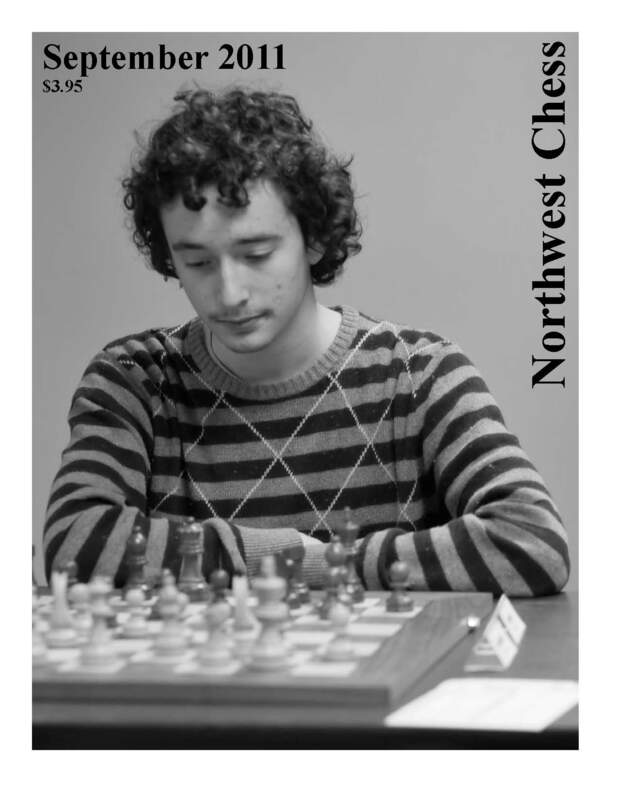 32-page issue with more on the Silverdale Beach Hotel Classic, stories on the Portland Fall Open, Eastern Washington Open and Washington Senior Championship, a report on Chess in Central Oregon, photos from the Spokane Chess Club, articles from Bill McGeary, Harley Greninger and Dana Muller, and the monthly NW Grand Prix update.